MILTON, Ontario (August 1, 2018) – Mercury Marine Canada was presented with a Brunswick Chairman’s Safety Award this week in Milton, Ontario. The facility, which has been located in Milton since 2008, recently celebrated more than one million hours of no lost time dating back to 2010. Brunswick Corporation Chairman and CEO Mark Schwabero presented the award to nearly 60 employees. The Milton team selected the United Way of Halton and Hamilton as recipients of the charitable gift of $10,000 that is made in conjunction with the award. Jennifer Loker, Senior Director of Resource Development, accepted the gift on behalf of the United Way. Loker noted that safety is an important shared value between Mercury and the United Way. “This gift will support the 48 programs in the Milton area, from youth to seniors to provide a safe and caring community,” said Loker. 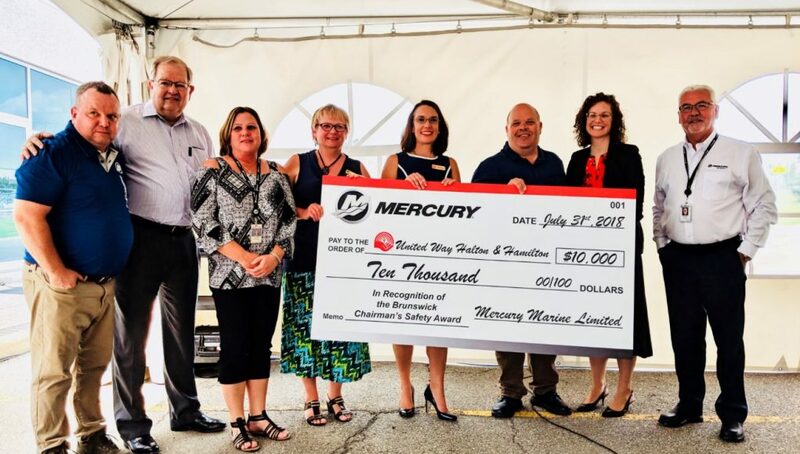 Mike Cluett, Halton Regional Councillor, Town of Milton, praised Mercury for placing a high value on safety and its employees as well as the positive influence that extends to the community. Next articleVideo: Double Dog Surfing!